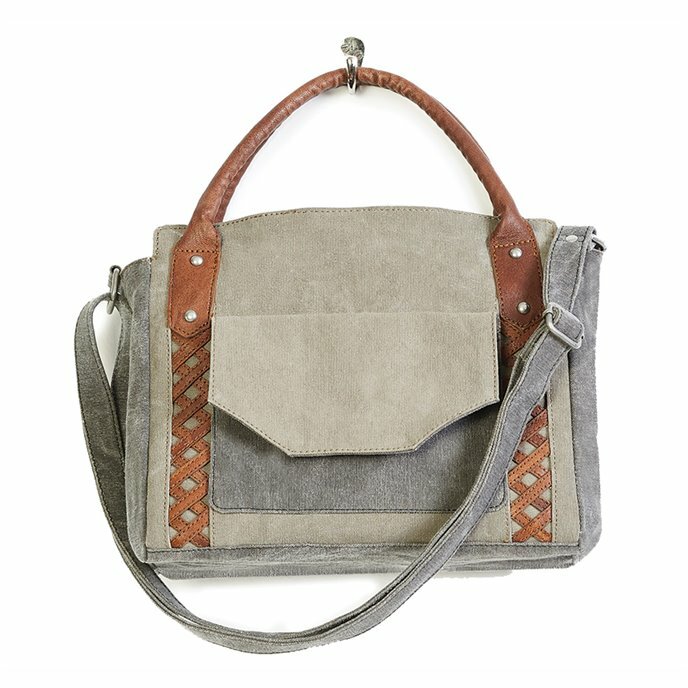 The Dolce Canvas Shoulder Bag by Mona B. features dual-toned canvas construction (neutral olive and gray) with brown leather accents. There is a large flap pocket on the front of the bag with magnetic closure. Dolce has canvas shoulder straps with 12" drop, as well as leather handles with 4.5" drop. An eye-catching criss-cross stitched leather design accents the front of the bag. Recessed zipper closure. Interior is lined with the signature Mona B. logo cotton fabric, and has one zipped pocket and two slip pockets. Measures 12"W x 10"H x 5"D. Made from up-cycled canvas from military tarps and tents. The fabric shows the history of its travels which may include stitch marks, minor staining and unique scars and bruises. Color variations and patches add to the uniqueness of each bag. Heavy cotton canvas and genuine leather.